Darling Downs Laser Skirmish is a hybrid combat adventure game mixing the best of indoor laser-tag and outdoor paintball skirmish. We provide mission based deployments that are action packed and exhilarating. Best of all there are no bruises! Our weapons fire an infra-red beam, similar to your television remote control, instead of shooting paint balls - meaning you wake up the next day with great memories of your Laser Skirmish adventure, while not feeling battered and bruised from the enemy gun shots. Most of our laser skirmish guns shoot over 150 meters, they all have pinpoint accuracy, red-dot or telescopic scopes, and you get unlimited ammunition in every mission. And any age can participate in this fantastic simulation game and you get great combat action full of fun and excitement. 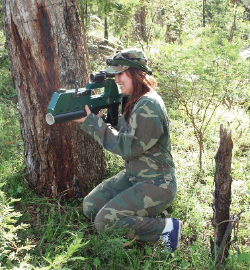 Darling Downs Laser Skirmish has several fields in the Toowoomba area, with more sites in Warwick and Dalby. We also cater for those who have their own field so you can play out the missions you want. From January 1st 2013, there will be a slight price rise for playing sessions. Darling Downs Laser Skirmish has not had a change in prices since July 2007. Unfortunately we cannot absorb rising operational costs any longer. $30.00 per player for 3 hour daylight bush playing sessions or 2 hour evening urban playing sessions. 2012 will see a new system for our frequent members club. Besides club members rank discount on playing fees, club members will be able to reserve a certain type of gun when booking - besides other great bonuses. Please feel free to forawrd any comments or suggestions you may have. First time player or a seasoned veteran?